Not only are obstacle courses FUN and well-liked by most kids, they're a great way to work on balance, sequencing, learning poses, and even just waiting for turns. There are so many great obstacle course ideas out there that have inspired me, so this is just a collection of some of my favorites. Since I play yoga with kids of all abilities, I have found that having visual representations of the activity/direction is helpful. I print out the activity/pose pictures I've linked below on card stock and laminate or slip into a heavy duty page protector. I typically use mats to mark of the space for each activity, and sometimes link the areas together with yoga strap "tight ropes", scatter blocks for "stepping stones", or line them up front to back or side to side for thin or thick balance beams. I usually play fun music that's positive and engaging, but not over-stimulating. 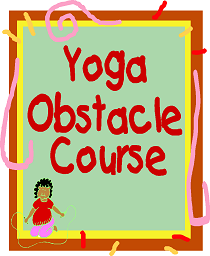 Obstacle courses are so easy to vary as the ideas are endless! Please don't hesitate to contact me if you have questions or would like to share additional ideas! Stand in tree on a block...try more challenging side first!